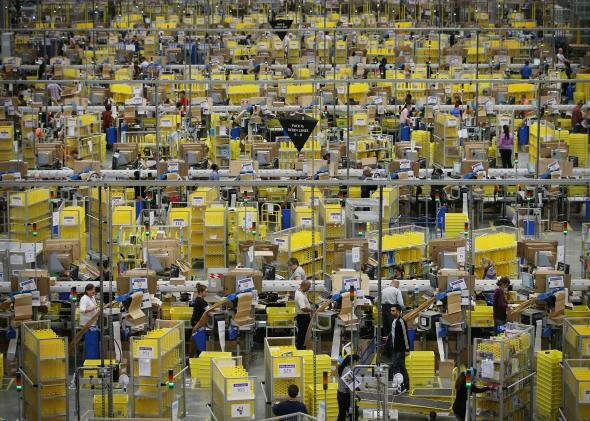 FAA gives Amazon permission to test delivery drones in the U.S..
FAA Relents, Gives Amazon Permission to Test Delivery Drones in the U.S.
A bird’s-eye (or possibly drone’s-eye) view of an Amazon warehouse. After Amazon threatened to take its delivery drone testing to other countries, and then did it (a lot), the Federal Aviation Administration has decided to offer the company a waiver on commerical drone restrictions. According to an FAA letter from Wednesday, Amazon will now be able to test its delivery drones at up to 400 feet in the air and 100 miles per hour over private property for the next two years. Amazon had previously received a waiver from the FAA in March, but it applied only to an outdated drone model. This victory for Amazon could be a unique exception as the FAA evolves its drone policy, but the more businesses chip away, the more the agency will be forced to respond.